Although bacteria construct exoskeletons without thinking about it, researchers still puzzle over the process. They know how subunits of peptidoglycan — the polymer that forms the cell’s outside skeleton — are synthesized inside the cell. What is unclear is how those subunits are converted into a complex, three-dimensional polymer on the surface of a cell. Some studies have indicated that the protein Mbl, which is associated with the cytoskeleton inside the cell, plays a critical role in this fabrication. Now researchers at Boston-based Harvard Medical School and at Harvard University in Cambridge, Mass., have shown that this may not be the case. They did so using fluorescent antibiotics to image the biosynthesis of peptidoglycan. Among other things, they found that fluorophore attached to the antibiotic could affect its efficacy. Cellular exoskeletons help microorganisms hold their shape against both internal and external pressure and are thus necessary for survival. In trying to understand how the layers of peptidoglycan assemble into the exoskeleton of living cells, researchers turned to chemical probes in the form of antibiotics that bind to peptidoglycan intermediaries. They labeled these antibiotics with a fluorophore, thus imaging them. Researchers used fluorescent antibiotics to stain bacteria in an investigation of how the bacterial exoskeleton is fabricated. Here, cells treated with the antibiotic ramoplanin labeled with the fluorescein (left) are compared to those treated with a membrane stain (center) with the two overlayed (right). The antibiotic pinpoints the precursors to the exoskeleton construction, which the other stain does not. Arrowheads and arrows point to old division sites (poles) and new division sites (septa), respectively. Courtesy Kittichoat Tiyanont and Suzanne Walker, Harvard Medical School. 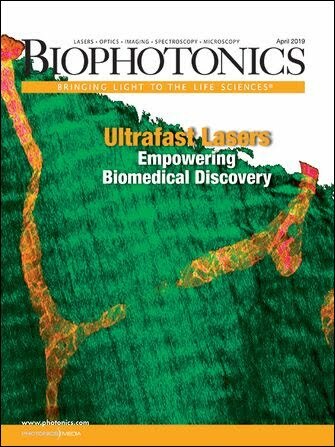 As detailed in the July 18 issue of PNAS, the researchers used an Olympus microscope equipped with suitable optics for fluorescence microscopy. They captured the image with a digital CCD camera from Photometrics, a division of Roper Scientific Inc., in Tucson, Ariz., and analyzed the data with software from Molecular Devices/Universal Imaging of Downingtown, Pa. Although the fluorescence microscopy setup apparently wasn’t anything extraordinary, its capabilities were not commonplace. “It’s still considered relatively new to be able to image these organisms that are approximately two to three microns in length and about a micron in width,” said research team member David Rudner, an assistant professor of microbiology and molecular genetics at Harvard Medical School. The researchers used the antibiotics ramoplanin and vancomycin. The latter had been used in similar studies, while the former had not. Of the two, ramoplanin is more specific; it binds only to the reducing end of the emerging glycan chain found at the initiation sites of peptidoglycan synthesis. Vancomycin, in contrast, binds to a dipeptide unit that is found in growing glycan chains and in some mature peptidoglycan. For that reason, the researchers believed that ramoplanin might be better for detecting synthesis sites. In their investigation, they also used a pair of fluorophores: fluorescein and BodipyFl. The first is large and negatively charged, while the second is small and neutral. The scientists were careful in selecting where on the antibiotic they placed the fluorophore. They also synthesized variants of the fluorescent antibiotics for use as negative controls. They looked at the minimum inhibitory concentration, the level at which the antibiotic level begins to affect cellular function. They experimented with the bacterium Bacillus subtilis and found that the fluorophore could have a significant effect. The concentration changed from 0.13 μg/ml for unlabeled vancomycin to 20.0 μg/ml for the fluorescein-labeled version of the antibiotic. Vancomycin labeled with BodipyFl had a minimum inhibitory concentration of 2.5 μg/ml. Ramoplanin, on the other hand, had a minimum inhibitory concentration of 5.0 when unlabeled, 20.0 when labeled with fluorescein and 10.0 μg/ml when labeled with BodipyFl. The researchers hypothesized that these fluorophore-induced changes could be a result of the negatively charged fluorescein being repelled by materials in the cell wall. That is why the neutral BodipyFl had less of an impact. With regard to peptidoglycan synthesis, they discovered that the levels of concentration of the antibiotics influenced the results. At a low concentration, less than two-tenths of the minimum inhibitory concentration, they saw bright but narrow bands at both old and new division sites in growing cells. At concentrations near the minimum inhibitory concentration, the pattern changed. Bands at the old poles, where it had been thought that peptidoglycan synthesis did not occur, grew faint, while the midcell bands became thick. The lack of fluorescent staining from the negative control — which was an antibiotic modified so that it would not bind to the cell at all — confirmed that the banded pattern arose from binding to peptidoglycan precursors. Because the antibiotics may interfere with synthesis, the scientists postulated that the picture derived from the low concentration case was more accurate. However, Rudner noted that further work is needed to confirm this theory. To be safe, he advocated that investigators using fluorescent antibiotics pay close attention to the concentration of both labeled and unlabeled probes to avoid problems. The researchers also looked at the effect of the actin homolog Mbl on peptidoglycan staining, using a mutant lacking in Mbl. They compared the observed patterns of the mutant with that of normal cells and discovered that both appeared similar, although a lower antibiotic concentration was needed for staining of the mutant. This result differs from that of previous work, which showed that Mbl was critical for peptidoglycan synthesis. Rudner noted that the difference could be explained if Mbl isn’t the only factor governing synthesis. “It’s entirely possible that it’s redundant with other mechanisms, and that it’s important but not essential for that process,” he said.